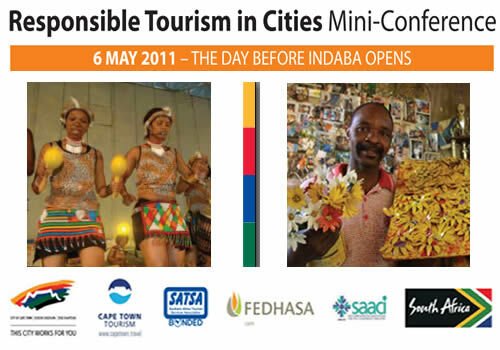 Friday 6 May the City of Cape Town organises a day event on topics specific to Responsible Tourism in Cities as part of the Indaba tourism conference. This may be an interesting event for those wanting to learn more about how Cape Town as a destination deals with township tourism. How does it fit in with the portfolio of the city and to what extent is it seen as responsible tourism? Participants can not only go to the conference in person, but there is also the possibility to participate online via live video streaming of twitter. Information can found on the website of the conference, but the wiki of planeta.com and the website of Responsible Tourism Cape Town contain more information. After the conference four sessions are will be made available on the Responsible Tourism Cape Town website as will videos of the presentations and discussions.